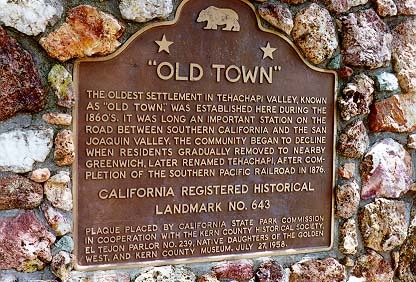 The oldest settlement in Tehachapi Valley, known as "Old Town," was established here during the 1860s. It was long an important station on the road between southern California and the San Joaquin Valley. The community began to decline when residents gradually removed to nearby Greenwich, later renamed Tehachapi, after completion of the Southern Pacific Railroad in 1876. NE corner of Old Town Rd and Woodford-Tehach Rd, 1.3 mi N of Hwy 202, 2.5 mi W of Tehachapi.